So, you want to find out what consumers or potential customers think of your product or service. You want the information to make smart decisions about your business. And you need to make sure your business is heading in the right direction and understand the best way to maximise profits and grow your customer base. The time is right to hold a focus group. But deciding to go ahead is just the beginning. To ensure you carry out a successful focus group there are lot of things to take into consideration. First and foremost, where will it take place? You may think it doesn’t really matter where you get your participants together, but choosing the right environment can make a huge difference to the insight you achieve and help make your focus group more efficient and more cost effective. So where should you begin? Firstly, you need to make sure the venue is easy to find and easy to get to. It should be somewhere private, quiet and free from distractions. It should be a place that feels comfortable for your targeted participants. This could be a room in the local pub, a conference room in a hotel or a meeting room at a local venue. Remember, you are trying to create a relaxed and natural situation, so don’t create any barriers that might stand in the way of getting what you need from the focus group. Sometimes your choice of where to hold your focus group will be limited by availability or cost. Despite this, it’s important to always bear in mind what effect the location might have on the responses you get from your participants. For example, if you’re carrying out research on the topic of fast food, surrounding them with posters focused on health and fitness gurus may skew your answers. Other considerations for the perfect venue include: is it the right size for a group discussion? Can they all see each other easily? Is it too warm or too cool? Is it free from traffic noise or music? Is the table the appropriate size for the number of participants you’re expecting? It’s a good idea to book the room for half an hour before and after the allotted focus group time, so you can arrange furniture and set up and pack away things like flip charts, projectors, refreshments and recording equipment to ensure everything runs smoothly once the participants arrive. Also, make sure you check the recording equipment. And don’t forget to put a nice clear sign on the door. You don’t want your participants wandering off before they’ve even arrived! 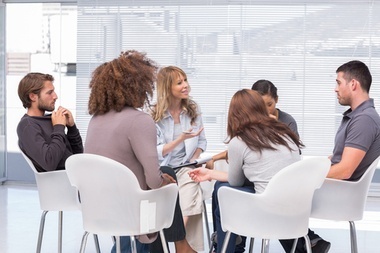 If you want to take things up a notch and get some professional help, thankfully there are lots of companies out there offering focus group facilities and hosting – and using one can be highly effective. A modern, state-of-the-art focus group facility has many advantages. It gives participants a neutral place to relax and concentrate on what you’re asking them as well as a room that’s the right size for your group, and invaluable support from the facility’s professional team, leaving you to focus on getting the insight you need. If you do decide to utilise a facility always check exactly what your package includes. You should have access to a client observation room, where you can watch respondents through a one-way mirror – there’s nothing like hearing what people think about your company live and up close. Make sure you have audio, visual and other technical support too. Ask what the recording options are, and what format you can take the recordings in, enquire about back-ups in case anything goes wrong. Other things to consider are does the room have air conditioning? Is there free Wi-Fi? Are refreshments included? You may be able to pay the same company to do even more for you – some, like Focus Vision, can organise focus groups using conferencing facilities – so you can view the research from anywhere in the world using live streaming and webcams. There’s one last vital consideration – always take into account what using a focus group facility costs. Will the information you get out of it make it pay? If the answer is yes, you’re onto something. Just make sure you set it up in the best place possible to get the results you really need. You can find many more great studios around the world here.